In this season, the somewhat drab Minneapolis landscape is lit up everywhere and accented with holiday decorations. The beautiful displays on each of the homes and businesses during the holidays can make your heart light and get you ready for the holidays ahead. Perhaps you’d like the same type of display for the holidays on your home but you’re unsure of how to go about doing it. Or perhaps you’re just not up for all the work involved. Perhaps you don’t have the time required to do the job right. 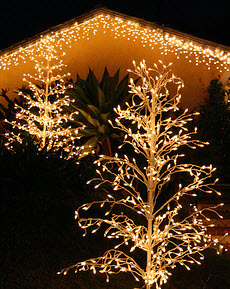 There is one solution – choose a professional holiday lighting contractor. At Architectural Landscape Design, we’ve got the tools and experience to create a winter wonderland for your property. Working with a company such as ours that can handle every step of the process – from hanging the lights and installing the decorations for you – means you’ve got time to really enjoy this season and take care of the other things on your list. We’ll work with you to come up with a design that reflects your taste, works within your budget, and accents your home in the best possible way. With our help you can put on a gorgeos display that will not only give you the beautiful holiday look you want. And when the holidays are over, sit back and relax, because we’ll be there to take everything down and put it away until next year. Even though there are only a few weeks left until Christmas and you’re feeling pressed for time, speak with a professional holiday lighting company that is able to do the work for you rather quickly so you’re able to focus on larger things while also getting just the right holiday look. This gives you more time for the important things in your life. It is never too late to have the Christmas display you’ve always wanted. You could do it yourself, but here are just a few reasons to turn the project over to a professional. We can give you more ideas than you can think of. Not only will you have a fully unique and personalized design, but everyone that passes your home will be impressed with how it looks. We can save you time when it comes to hanging your own holiday lighting and taking it down for storage. This is a big thing during the holidays, since it seems like a lot of people do not have enough time to get things done. All you have to do is call and make an appointment for a design consultation. Award-winning customer service is something we can give. If you have questions, concerns or even ideas, we are here to listen. We’ll work with you to bring your holiday visions to reality And the installation will be done when it is convenient for you, since we understand you have a busy life, especially at this time of the year. There is no waiting around for the job to be done either; punctual and precise are always good things you can expect from us. You will have many choices of lights and decorations to choose from when it comes to having your home decorated. Not only that, but with Architectural Landscape Design, we offer a free consultation on the decorations that you want to put on your home. Give us a call today to set up your appointment for the beautiful lighting display you want this holiday season. There’s still time to get your landscape in the holiday mood!